Apple’s consumer electronic items are by far some of the best computer hardware available in the industry. We covered all the Black Friday and Cyber Monday deals that were offered by Apple last month when the 2009 holiday season kicked-off. And now as the Christmas eve nears, Apple is offering fast and free shipping on everything you pick from the gift guide they have placed on the online Apple Store site to celebrate the 2009 Free Shipping Day. Apple is offering free shipping offer on their 13, 15 and 17-inch MacBook Pro models. 13-inch MacBook Pro with 2.26 GHz processor starts for as low as $1199 where as the one with 2.53Ghz processor starts for $1499. 15-inch MacBook Pro comes 2.53, 2.66 and 2.8Ghz processor options, and they start for as low as $1699, $1999 and $2,299 respectively. They 17-inch MacBook Pro model comes with 2.8Ghz Core 2 Duo processor and it starts for as low as $2499 for the basic model. Free shipping offer is valid on all the above mentioned MacBook Pro models and they’ll ship it to you within 24 hours time. Click here to learn more about this offer. Apple is offering free shipping on all models of iPhone for a limited time only. Price of iPhone 3G 8GB on an AT&T contract is $99, while for the iPhone 3GS 16GB model is $199. 32GB version of iPhone 3GS is available in both white and black color for $299. Free shipping offer is valid on all these models and they’ll ship it to you in 24 hours time. Click here to learn more about this offer. 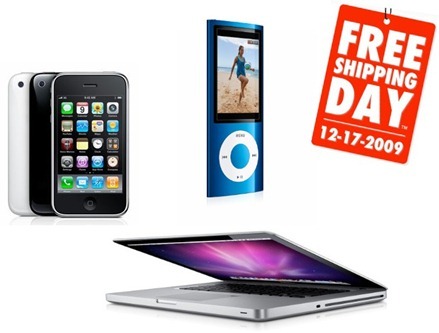 Apart from iPhone and MacBook Pro, Apple is also offering free shipping offer for up to two days on selected items such as iPods, iMacs and Apple TV. Apple accessories such as AirPort Express, Time Capsule, Wireless keyboard, Headphones, Magic Mouse, and some software’s (including from third-parties) also included in the free shipping offer deal. You can check out the online Apple Store site to learn more about the free shipping offer on all the models of MacBook Pro. You can follow us on twitter or join our facebook fanpage to keep yourself updated on all the latest Free Shipping Day 2009 Deals.